Many inexpensive digital panel meters, such as the one shown below, are designed to operate from a 9v battery. 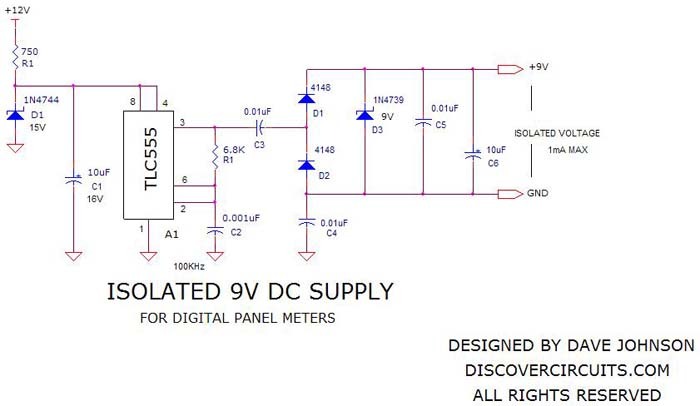 However, the nature of the panel meter internal design often requires that the DC supply used to power the device be isolated from the ground terminal of the panel meter’s input. This often makes it difficult to use with a common connection between a DC power supply ground and a sensor’s circuit ground. But, you can generate this floating voltage fairly easily using the simple circuit below. This hobby circuit below is powered from a 12v to 15v supply and generates a 100KHz square wave signal, using a CMOS version of the 555 timer. This AC voltage is rectified and limited to +9v using a charge pump method. The two 0.01uF capacitors maintain a floating voltage for the panel meter, so its voltmeter ground input can also be connected to the DC power supply ground.